With a pass rate of over 90%, our DELE Exam Preparation Course will give you the best preparation possible for all aspects of the exam! The DELE is an official Spanish diploma that is internationally recognised in any country from Spain to Argentina. The DELE Diploma is issued by the prestigious Cervantes Institute and is a life-time certificate of Spanish. The DELE is very useful and highly sought after in both academic and professional environments. Passing the DELE exam, therefore, is a big advantage. If you want to certify your Spanish level, prepare for your exam with AIL Malaga. Before enrolling on the DELE exam, we suggest you do a level test with our DELE expert teacher, that will help you choose the right level for you to optimise your chances of success. Make the most of your time with AIL Malaga and let us show you some of the best of what the city has to offer! Monday- Friday (usually) from 5:10-6:50pm! Textbooks with audio/visual materials, handouts, the school’s own materials, and the internet. The DELE Exam preparation course is the perfect course to maximise your possibilities of passing the exam. In the general Spanish classes you will learn the vocabulary and the skills needed for the DELE exam whilst in the classes focused on DELE preparation you will do mock exams and learn techniques to excel in each of the exams. 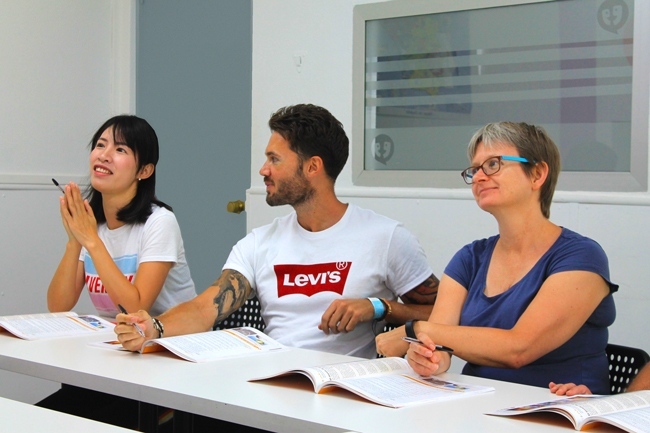 Our teaching methods, tailor-made for each student and aimed at developing all communicative skills, make the process of learning Spanish with a focus on passing the DELE exam fun and fascinating. The DELE preparation course is a perfect combination of general Spanish classes and specific exam classes needed to obtain the DELE Spanish Diploma. The DELE certificates are the only officially accredited qualifications issued by Spain’s Ministry for Education that are administered internationally. The certificates are recognised internationally by all types of companies and by public or private educational systems. They are mainly used for educational and professional contexts. • It is highly regarded by universities and recruiters. • It is a valuable benefit to your gap year experience. • It is necessary for many university courses. The DELE is an asset in the job market and for accessing educational institutions, not only in Spain but also in more than 90 countries where the tests are administered. • Answer 9 multiple choice questions on 3 different texts. There are 4 tasks with 9 multiple choice questions about texts. • Link a series of fragmented sentences. The candidate will complete 4 tasks based on four recordings, 25 questions with multiple choice. The 4 tasks given are based on general ideas and simple sentences. The candidate has to do two writing tasks, one consisting of 30 words. • Understand texts with simple sentences like rules, instructions or restaurant menus and obtain the key information. • Correctly answer a multiple choice questionnaire based on short texts. • Recognise nouns, words or sentences and understand the meaning of easy instructions. The candidate will have 5 tasks and try to get general ideas from statements, radio posts or phone conversations. • Monologue (3-4 min. ): the candidate must be able to talk about basic information. • Answer questions based on different texts. The questions are multiple choice. • Answer questions by obtaining information from a text. The candidate has to do 4 exercises based on simple dialogue and/or recorded information. The candidate must write two texts: the first could be a letter or a forum message, an email, or a blog entry. The second one could be a journal entry, a biography and it could include descriptions or narrations, presentation of information and personal opinions. The candidate must be able to have a conversation with the examiner. Graphic materials can be used to help the candidate start the conversation. The candidate has to answer 12 multiple choice questions on 4 texts. The candidate will answer 12 multiple choice questions based on 4 recorded texts such as advertisings, news, conversations or interviews. The candidate must write two texts. The first will be a letter. The second will be an opinion article for a newspaper, a blog or a magazine. The candidate has to create a monologue about several possible ways to solve a situation. The DELE candidate could choose between different options to prepare for the argument. • Reconstruct the structure and identify the relations between ideas in order to complete paragraphs. • Listen to a recording and then summarise it by writing an article (220-250 words). The candidate has to highlight the main ideas of the recording. • Write a text of 220-250 words, trasmitting their thoughts clearly. The candidate will create a monologue based on a short text, discuss and debate about the opinion that they have expressed before, and have a conversation based on graphic materials with the jury. • Answer 16 multiple choice questions on 4 recorded texts. The records will be discussions between several people, or news transmitted through media channels. • a letter talking about a subject that is not private (text between 150 and 200 words). • a composition (text between 150 and 200 words). The candidate has to create a brief structured monologue and talk about several possible ways to solve a problem. They will have the choice between different options proposed to help they to prepare the argument. Simply looking for an intensive approach and fast results in your Spanish? Our Intensive Spanish course is for you!